The odds of seeing a Red Squirrel in the Dingle Boardwalk in Llangefni is about 50% I would say – going on my own experience. So, if you are visiting Anglesey this coming October Week then you should be in luck. What is really wonderful for the sighting is that they are generally close enough to be able to see head movement as they prepare to launch themselves from tree branch to tree branch. I have been enjoying Autumn this year more than in a long time as responsibilities are being assumed by others. So there we find ourselves, me watching the Red Squirrel and it me. 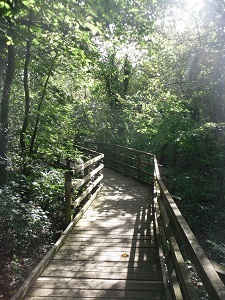 The boardwalk leads you through this delightful woodland of deciduous and pine trees and there is always something or other rustling through the undergrowth and crunching the fallen leaves to intrigue your imagination. The best places to spot a Red Squirrel are along the boardwalk and in the woodland path beyond. There is also a fair chance that you’ll see one further along toward the Cefni Reservoir. I have been told that Climate Change may well be changing the Winter behaviour of squirrels among many animals with their being more active across the entire winter period. Therefore, it stands to reason that whatever time of year you choose to visit the Nant y Pandy Nature Reserve in Llangefni that you will encounter one of our most popular Anglesey russet inhabitants and very close neighbours. 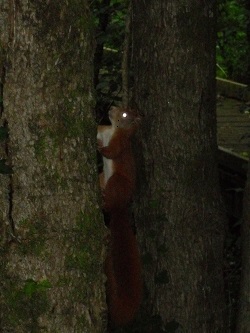 Go back a dozen years and your chances of seeing an Anglesey Red Squirrel were zero. If I average my visits sightings over this summer and now Autumn then I see around 1.33 cute critters per visit. Remember that you can also make sightings in Newborough Forest, Llyn Parc Mawr and Mynydd Llwydiarth in Pentraeth. Burying your nuts ... As it were. 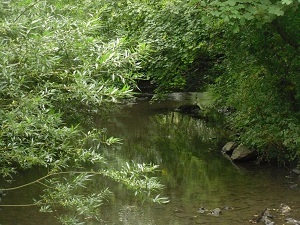 The days of Tarzan swinging through the jungle that is the Dingle in Llangefni are distant memories, although the gasps of the wild woodland salmon can still be heard on quiet and sultry summer evenings in the area of the old water works. The Dingle in Llangefni is a wonderful spot for stopping and listening. We make too much use of our direct vision these days. Blame television myself. The eyes primarily evolved to notice segmentation and differentiation. That is, they check for prey in camouflage and when they break away respectively. So, with the above bit of science firmly ensconced in our brains please believe me when I tell you that the best way to spot Red Squirrels is not to strain but to listen and to employ peripheral vision. Gaze without focus until your eyes detect movement for you. Then focus. On listening, once you've spotted a few Red Squirrels you will learn that make a unique noise that once heard is never forgotten. Plus, be aware that they do also whinge and moan when the partner is not playing ball and won't tell them where they've buried their nuts. The latter may not be true but pairs do seem to complain a fair bit. As I write in the main piece above, you have a much better chance of spotting Red Squirrels in the Dingle and Nant y Pandy in Llangefni than anywhere else on the Beautiful Isle of Anglesey. Once you've learned how to gaze and listen then you should march out to Newborough Forest and Pentraeth (down by Wern y Wylan Beach in Llanddona) armed with the rquisite skills. Red Squirrels are far more entertaining in real life than Disney ever managed to convey. I am misleading you a bit about the location - if not entirely. Not sure if you can pick this up where you are but if you can please put it in your browser and enjoy. These Red Squirrels are not from Anglesey but Estonia, which in a geographical sense can be viewed as being a bit to the east of Llangwyllog. Anglesey as an island has protected well the Red squirrel from its mainland counterpart, the imported American Gray squirrel happily I say. This year, in the state of Michigan, USA. I have seen actual Black squirrels. I'm sure they are Gray squirrels but feeding of the trees Black walnuts may be the contributor to this new phenomenon. Quite stunning to see. And, to hear of the well being of the glorious Red Squirrel right there in Nant Y Pandy makes for seeing a truly wondrous joy to behold of Mother Nature and her diverse artful Life forms.. to express, such is Her Nature, purpose, in our beautiful Univers. Diolch I Dduw..